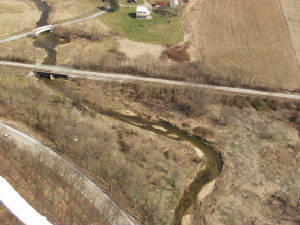 Often, when land is developed in the Codorus Watershed, nearby wetlands are filled and streams are channelized. This may result in NPS pollution by changing the way water is infiltrated into soils, runs off the land, and flows down our streams. When a wetland is filled, we lose it's natural ability to filter pollutants before they reach the Codorus Creek. The hydrology of the stream is changed too. Before the wetland was filled, the stormwater runoff was slowed down by the wetland. The excess water was allowed to evaporate and infiltrate through the soil and vegetation. Without wetlands, increased amounts of stormwater runoff now run directly into the creek more rapidly and may cause increased flooding downstream. 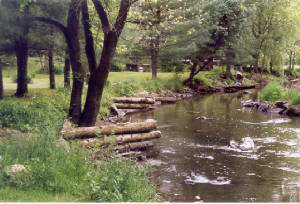 When streams are channelized by straightening and removing riparian vegetation, the water in the Codorus flows downstream faster. This results in streambank erosion, channel deepening, and flooding downstream. It also adversely affects the aquatic plants and animals that live in the stream.